Ready to use, organic-based houseplant feed, promotes growth, colour and long-lasting bloom. Ideal for an array of houseplants, chillies, peppers and herbs, Houseplant Boost is easy to use and gives exceptional results. 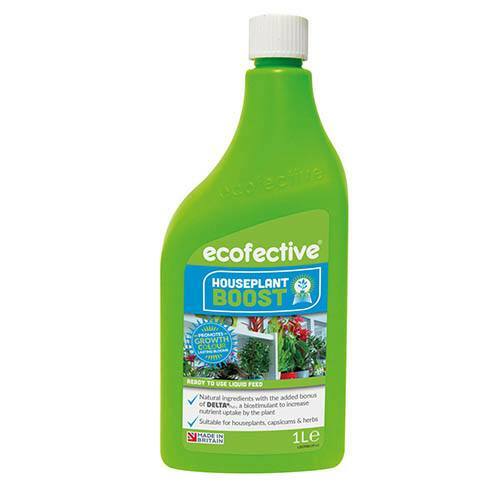 Child, pet and bee safe, ecofective Houseplant Boost is a ready to use, natural based feed designed for houseplants. Apply regularly to encourage healthy growth and promote abundant flowers and leaves. Used by organic farmers the formula comes with the added bonus of DELTA+, which contains bio-stimulants to increase the nutrient uptake, enhancing the plants growth and development. Simply water and apply one capful of feed. No mixing is required, simply apply straight from the bottle. The natural based ingredients mean it is safe to use around children, pets and beneficial insects including bees. The atmosphere within your house can be very dry, particularly when using central heating. Ensure your plants are always well watered – you can check this with your finger. The soil must be moist about 1 inch under the plants surface; if it’s dry watering is required, if it’s soggy the plant has been overwatered and you risk root rot. Always move the plant off the window sill, away from direct sunlight when applying the feed to avoid scorching.